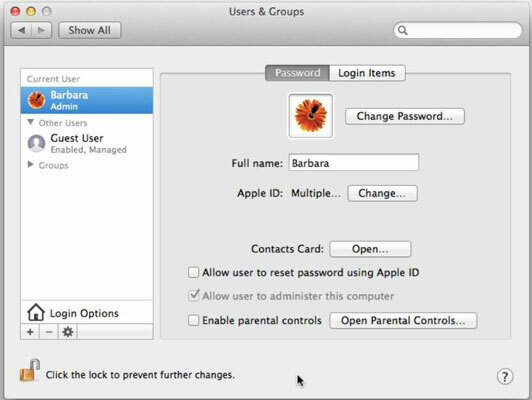 Just as security on your Mac starts with a strong password, so does it hinge on changing that password periodically. Many online banking and credit card services require you to change your password every so often, some as often as once a month, which certainly keeps password-generating apps popular. Click the Users & Groups icon to open the Users & Groups preferences pane, as shown in this figure. Click your username under Current User in the left pane (or another account name under Other Users that you want to modify). If you haven’t created any additional users, you see only yourself listed. A dialog appears, displaying text boxes for typing your old password and typing a new password twice to verify that you typed your new password correctly. Enter your current password in the Old Password text box. Enter your new password in the New Password text box. If you want your Mac to evaluate your password or invent a password for you, click the key icon to the right of the New Password text box. The Password Assistant opens. Choose the type of password you want from the Type pop-up menu. Manual lets you type in a password that you invent, and Password Assistant rates the security level of your password. The other five types offer various character combinations and security levels: Memorable; Letters & Numbers; Numbers Only; Random; or FIPS–181-compliant, which creates a password that meets federal standards. Drag the Length slider to set how many characters you want your password to have. The password appears in the Suggestion field, and the Quality bar shows how secure it is: the higher the quality, the safer the password. A 26-character Memorable password is of highest quality (see the figure). Click the Close button. The chosen suggestion is inserted as bullets in the New Password text box. Enter your new password in the Verify text box. 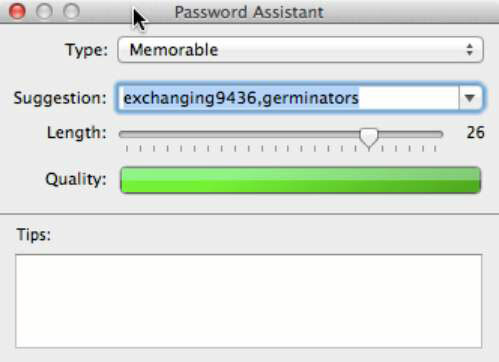 Enter a descriptive phrase into the Password Hint text box. Adding a hint can help you remember your password, but it can also give an intruder a hint on what your password might be. Using our Iw0sLou!se example, you might use the phrase “favorite song crab.” The intruder would have to know you pretty darn well to figure out that one! Click the Close button to close the Users & Groups preferences window.